Roughly a quarter of the way through the 2015 hurricane season, the period has gone pretty much as the National Oceanic Atmospheric Administration's expected. In short, it's been decidedly quiet. But the same can't be said for tornadoes. In fact, since January, an estimated 12,000 twisters have touched down to varying degrees of intensity, according to preliminary estimates from the National Weather Service. And when they do strike, tornadoes can be extremely devastating to property, causing homeowners and business insurance damages in the tens of thousands of dollars among individualized claims and billions overall in any given year. Generally speaking, May is the busiest month for tornadic activity, based on estimates from the National Climate Data Center. However, unlike hurricanes - which primary strike the Atlantic from June to the end of November - there's no offseason for twisters, occurring any time, any place. Only a few weeks ago for example, 12 twisters hit northern Illinois, according to NWS.Though the outbreak wasn't widespread, Grundy and Will counties bore the brunt of the storms' wrath, with winds clocked at between 130 and 160 miles per hour. Through the year thus far, May 6 was the most active period for twisters, with more than two dozen reported during the 24-hour period. 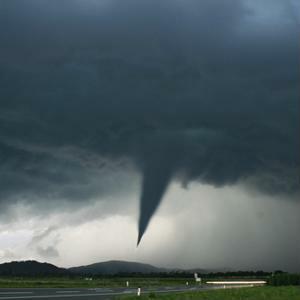 From 1994 to 2013, more than 37% of insured catastrophe losses stemmed from tornadoes, according to Property Claim Services, most of which struck the Great Plains and Midwest regions. Of course, no one can prevent twisters from developing, but there are several things that you can do to protect yourself if they're in the forecast. These tips from the Federal Emergency Management Agency can help you understand what to do when bad weather develops. Whether you're at home or at your place of employment, the best place to be during a tornado is the lowest floor. Tornadoes can produce massive amounts of winds capable of shattering windows that aren't reinforced. If you're in a windowed room, keep away from the windows to avoid injury in the event they break. According to FEMA, flying debris is routinely what's responsible for tornado-related injuries. You never know where you'll be when a tornado hits, but if you're fortunate enough to be inside, you'll want to seek out additional shelter. For instance, hiding underneath a desk can protect you from falling debris. The worst-case scenario is to be outside when a tornado strikes. But even here, there are things that you can do to protect yourself. If driving, don't try to outrun the tornado, as this is an exercise in futility. If near any kind of shelter, you're better off parking and running for the closest standing structure. If this is impossible, though, park the vehicle, buckle up and cover your head. Fortunately, forecasters' technology has advanced to a point where meteorologists can pinpoint where tornadoes are most likely to strike when conditions are favorable for them. FEMA has some additional recommendations for what to do before and after they strike so you can mitigate property loss. Business Insurance can provide for damages caused by tornadoes, helping replace belongings that are destroyed as well as the physical structure of an office place. For more information, speak with your local independent agent.